Galaxy Zoo: Are Bars Responsible for the Feeding of Supermasssive Black Holes Beyond the Local Universe? Supermassive black holes are thought to reside in the centers of most galaxies. These massive objects can produce powerful jets of energy that may significantly influence the evolution of their host galaxies. While we believe that black holes have an important role in galaxy evolution, a crucial unknown aspect about black holes is how they are fueled and turn into active galactic nuclei (AGN). Among the proposed black hole fueling processes, bar-driven secular evolution is among the most popular. Bars are linear structures of stars that stretch across the centers of galaxies. They are theorized to fuel black holes by driving gas from the outskirts of galaxies into the very centers, where supermassive black holes lie. Previous studies have tested whether bars can fuel black holes by examining whether there is an excess of bars among AGN hosts compared to non-AGN hosts. For the most part, those works found that there was not a significant enhancement of bars among AGN hosts, leading them to conclude that bars do not fuel black holes. But almost all these previous works were limited to the local universe, i.e., in the present, where the number of AGN is the lowest across cosmic time. In this work, we investigate whether there is an excess of bars among AGN hosts beyond the local universe, i.e., in the distant past, up to 7 billion years ago. In this epoch, the number of AGN hosts is much higher, giving us a better glimpse of the identity of the black hole fueling mechanism. To conduct this experiment, we created two samples: 1) a sample of AGN hosts and 2) a carefully constructed control sample of non-AGN hosts that are matched to the AGN hosts. In order to create the largest samples possible, our experiment utilized three of the most popular extragalactic surveys: AEGIS, COSMOS, and GOODS-S. With these samples, we used the Galaxy Zoo: Hubble bar classifications to identify barred galaxies. 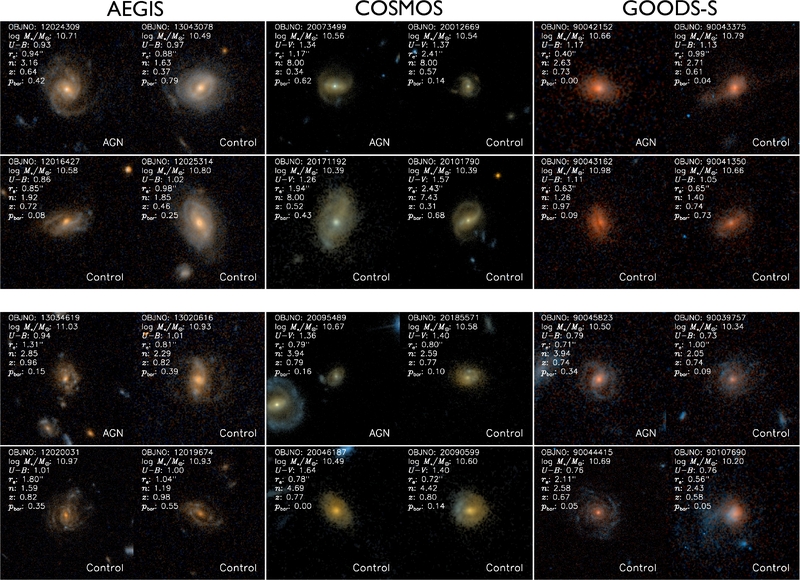 Below is a gallery of 6 sets of AGN and their corresponding control galaxies, 2 sets from each survey. Our main results are shown in the figure below. We have two probes of bar presence—bar fraction (left) and bar likelihood (right)—for the AEGIS, COSMOS, and GOODS-S surveys. 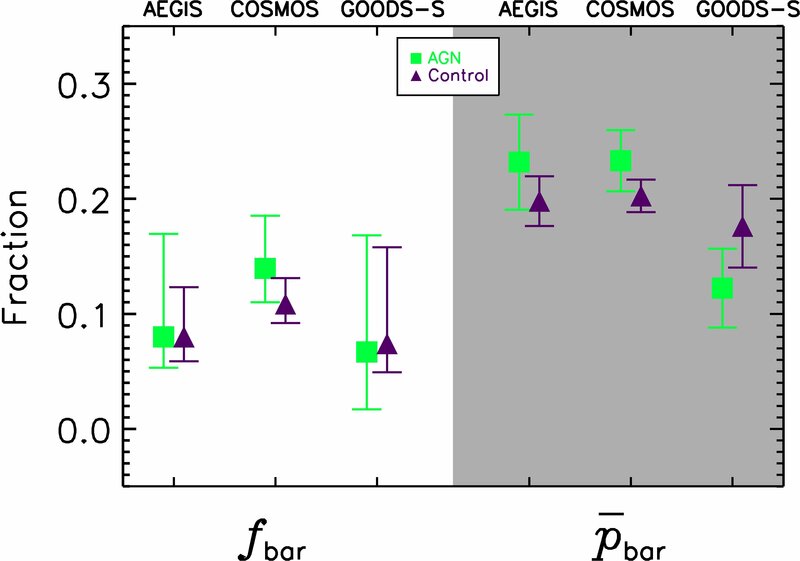 We find no statistically significant enhancement in the bar fraction or the bar likelihood in AGN hosts (green squares) compared to the non-AGN hosts (purple triangles). Our results, combined with previous works at the local universe, indicate that bars are not the primary fueling mechanism for supermassive black hole growth for the last 7 billion years. Moreover, given the growth of supermassive black holes over cosmic time, our results imply that bars are not directly responsible for the buildup of at least half the local supermassive black hole mass density. Therefore, although among the most popular fueling mechanisms, it seems that bars do not fuel black holes. However, this result does narrow the search for the real black hole fueling mechanism.